The socialsphere continues to expand with new channels or new and improved features launching nearly every day. Twitter, Facebook, Instagram, YouTube, Google+… the list goes on. For the user of these social networks, the question is how much time do you want to spend posting, tweeting, pinning, creating or following? For businesses marketing to these users, the dilemma is how to optimize your marketing investment, content, and business impact by reaching the right prospective customers in the right channels. But which channels are a must-have for your business? The reality is it’s virtually impossible to do them all – or at least do them all well. And you shouldn’t try, frankly. Where is your target buyer? Is there an untapped opportunity? How many channels can you do well, consistently? Are there geographic differences you need to take into consideration? Channels, competitors, etc. A landscape of top cloud computing providers. One of the first differences we notice among the tens of thousands of companies we track is whether the company is a business-to-consumer (B2C) or a business-to-business (B2B) player. As social media channels have matured and other niche players have entered the market, there has been some natural delineation across the B2C and B2B lines. Who is Where Among the Top Soda Brands? First, we attempted to choose soda brands that were standalone products versus big corporate names. In this landscape we included Diet Coke, Diet Pepsi, Dr. Pepper, Faygo, Jones Soda, Mountain Dew, and Sprite. We intentionally did not add Coke (classic) or Pepsi, as Coca-Cola does not separate its massive corporate presence on social networks from its Coke product presence, so we would not be comparing apples to apples (or in this case bubbles to bubbles). Pepsi Co actually does have separate Pepsi product social handles, as it does also for Diet Pepsi, Mountain Dew, and other specific brands. This product versus corporate branding is an interesting topic in itself that we’ll tackle in another blog. In looking at the high level social matrix for this landscape, the soda brands have a consistent presence on Twitter, Facebook, and Instagram. Another thing I have seen in B2C brands is a great use of images in their social media, especially when it comes to food and drinks, which drives stronger engagement. So, it’s not surprising to see Instagram topping this list. Google+ and YouTube are interesting. Clearly most brands are attempting to add these to their list, but we’ll have to see how the engagement looks to see if that’s working for them. And in terms of LinkedIn, this isn’t surprising, as these brands (other than Faygo and Jones Soda) are one brand of much larger organizations as noted above, and LinkedIn tends to be focused on company presences, not product. As noted above, this is just one step – discovering where your competition plays. Next, you want to dig in a bit more beyond pure presence to see where these companies are truly delivering content and engaging versus just setting up a basic presence. The first thing that pops out to me is how some of the larger brands like Diet Coke and Diet Pepsi are not leading the Facebook popularity contest. 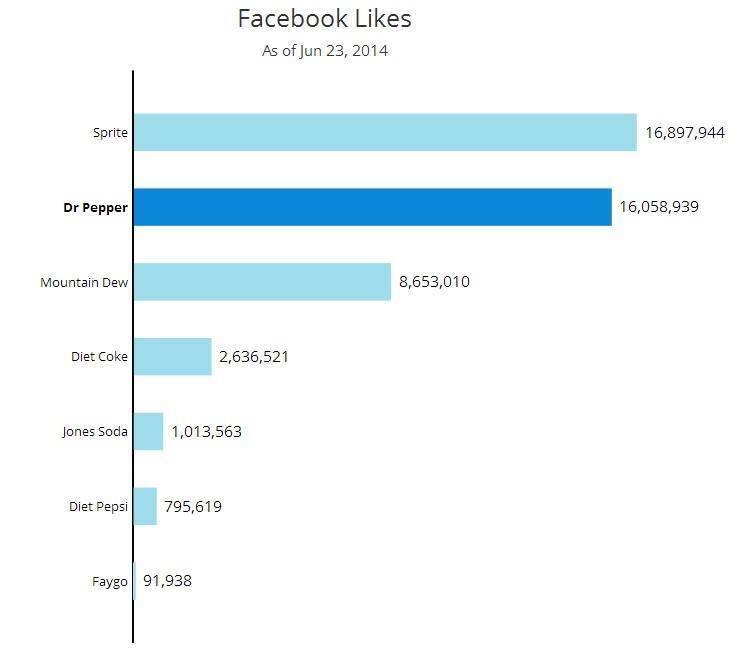 Sprite is in the lead for Facebook Likes, followed by Dr Pepper in a close second, and Moutain Dew in third. 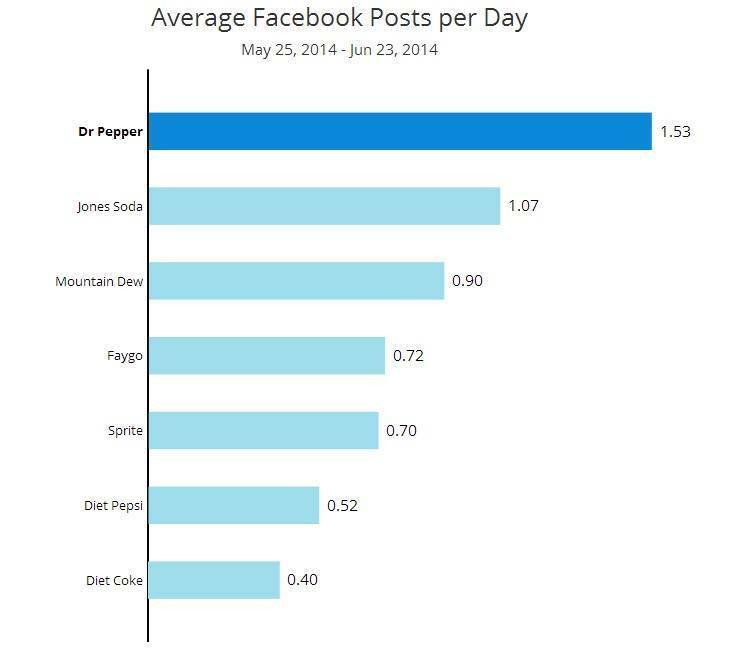 Dr Pepper is also a top poster, averaging 1.5 posts per day. Jones Soda pops to the top for frequency as well, and again, Diet Pepsi and Diet Coke are the laggards. From this, I am expecting to see these two diet brands show off in some other social channel. But as I noted above, quantity of likes and posts is fine, but more importantly is how many users then engage or share that content. When we look at this landscape’s total engagement, we finally see Diet Coke make an appearance. So the brand may be doing less than one post a day, but it is engaging with its followers. 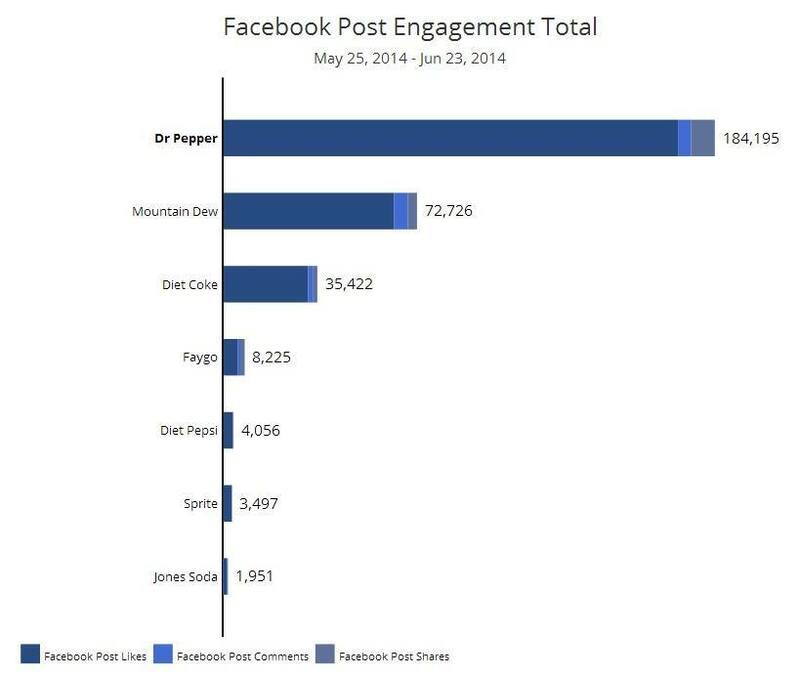 Dr. Pepper is clearly turning out to be the overall channel leader in Facebook across all key metrics. Pepsi and Mountain Dew continuing to lead. Total engagement is the aggregate number of interactions (likes, comments, and shares) of posts on this company’s Facebook page during this time period. Are the Same Brands Leading on Facebook and Twitter? Diet Coke is clearly putting more investment in Twitter, coming in second for total followers (at 282,000+) behind leader Mountain Dew (with 363,000+), with Dr. Pepper hot on its heels (269,000+). 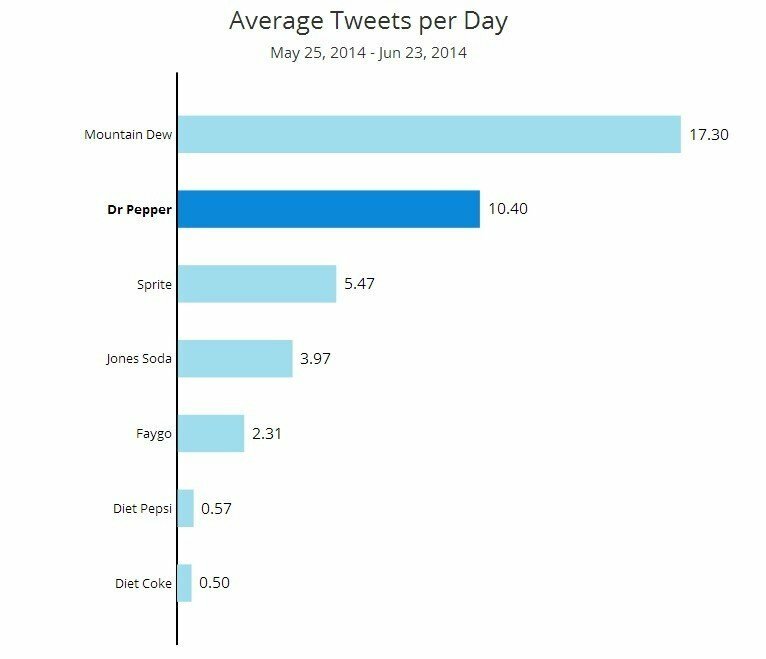 Mountain Dew is also the most prolific on Twitter, tweeting more than 17 times on average per day. Here, Diet Pepsi and Diet Coke again taste flag, with an overage .50 tweets per day. Mountain Dew also has a loyal following, with the highest total engagement, followed by Dr. Pepper and Diet Coke. What about Instagram? Mountain Dew is putting emphasis on this channel as well, where it has the most followers of the group (nearly 65,000) and has the heaviest total average engagement per post, followed by Sprite, Diet Coke and Dr Pepper. If I was in this group, I would seriously evaluate what Mountain Dew is doing to grow its fan base and create great content that engages its followers. Is Cloud Computing Hot in Social Media? Now, let’s check out the cloud computing providers. First, you’ll immediately notice a lot more white space in our charts. Twitter is clearly a must-have as is YouTube, but a real mixed bag for Facebook and LinkedIn, with Instagram barely showing up. This could signify an opportunity or could mean that the customers and influencers for cloud computing are focused on Twitter and YouTube, so emphasis needs to be there. In digging through the data, Twitter is definitely the favorite of most of these providers, with healthy follower figures, heavy daily tweeting – Cisco averages 10+ tweets – and growing engagement across all primary players. While all these companies are on YouTube, AWS and Rackspace are the only consistent ones bringing in significant numbers of followers (in the thousands) and high engagement levels. While these are all cloud companies, their target market varies. Look at your own company’s social footprint, and then answer those five questions above and see where you should prioritize your social investment. Just because a social network exists, doesn’t mean you have to be there. In the same light, if you are competing against a much bigger company or companies, pick the channels where you can have the most impact and engagement and invest to win.